Treasure Quest – Complete daily quests from your personal treasure map and win up to $100,000! There will also be freerolls running every day until 25th February 2017. Make sure you take advantage of your 4 free tickets to the $6k Pirate’s Prize tournaments for every depositing player. Earn more tickets by completing your daily map challenges. The $1,500 Treasure Quest Tournaments are completely free to join! $6,000 Pirate’s Prize Tournament – Every day at 21:08 GMT. $5 million Super Series XL – Every player will receive 2 free tickets via email to get them started in the Super XL qualifiers where there’s life changing money to be won. Complete missions to receive more tickets to increase the odds. Play live poker in a casino near you with 888 Poker Local Live, there is an extensive schedule of events for 2017. 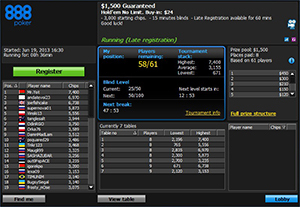 Freerolls and Qualifiers are running now, find them through the Live Events tab in the lobby. Full details of all the current promotions are on the 888 official website. New players worldwide, except UK, will have $8 credited to their account immediately when they register made up of $2 cash and $6 in tournament tokens. To claim, simply sign up with a valid email address then 888 will let you know when your package is available for play. The remaining $80 free bonus will be released in 10 chunks of $8 per 250 status points earned, the bonus is available for 90 days Status Points accumulation can be easily checked through the software lobby to the ‘My Rewards’ page. There is no deposit required and the offer is open to any new player in Australia, Austria, Brazil, Canada, Cyprus, Finland, Germany, Greece, Hungary, India, Ireland, Japan, Kuwait, Lebanon, Luxembourg, Malta, Netherlands, New Zealand, Norway, Poland, Russia, Singapore, Slovenia, South Africa, Sweden and Switzerland. .
UK only: When you join 888 Poker from the UK you will get £20 absolutely free, simply download and register with a valid email address, no deposit required. Note: To make sure you receive the full free bonus package we suggest you sign up via a Desktop PC or MAC, if you can, as iPhone and iPad players will only be able to claim in Countries where 888 Poker is supported on iOS devices. We are pleased to be able to offer our players an exclusive double your money welcome bonus up to $600, instead of the usual $400, arranged by us with 888 Poker for you. As you play you will earn points at a rate of 2 bonus / status points for every $1 you contribute in rake or tournament fees. For every 100 bonus / status points you earn $10 of bonus will be released into your poker account. You have 90 days to convert your bonus points into bonus cash. You’ll be earning bonus / status points at the same time and rate but bonus points are only awarded when you have a bonus pending. Status points are saved up and count towards your VIP status. Once you have made your first deposit you can register for a seat at the next $100k First Depositors Challenge, maximum number of players restricted to 1000. These free tournaments are held on Fridays at 7pm UK, 2pm New York time. 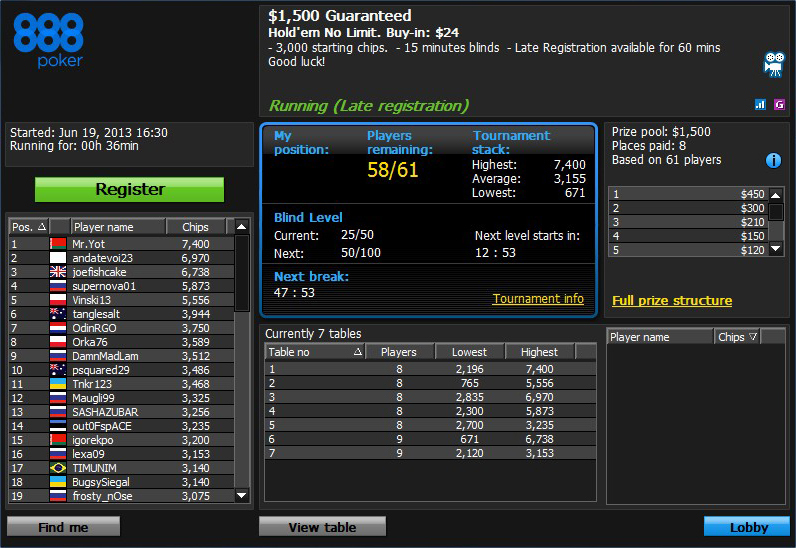 The top 10 finishers go forward to the Sunday Challenge, worth $90 buy in, at 7.35pm UK, 2.35pm New York time. Within 48 hours of making your first deposit you’ll get seven free entries into the First Depositors Freerolls where you could win your share of $3500. These exclusive to new depostors freerolls are absolutely free, no catch. 888 is one of those truly household names within the online gaming industry. It’s an absolutely huge multi-national brand that’s been around since the late 90’s with its poker offering launched way back in 2002. What this means is that you are dealing with a great quality, trusted brand rather than some obscure poker site you’ve never heard of. I’ve been playing on 888 for some years and in that time I’ve seen many positive changes and tweaks which have ended up with the finished product you can enjoy today. In this review I’ll be giving you the ins and outs (both positive and negative) of this hugely and increasingly popular online poker site so you can decide for yourself if you’d also like to try it. My favourite two features of 888 Poker are its top-notch software and their excellent customer service. You can either play poker at 888 by downloading and installing the poker client or, ideal for Mac and Linux users, you can opt to use ‘Instant Play’ which allows you to enjoy the same quality games directly from your internet browser. The 888 software is fast, efficient and easily customised so you can have it set up exactly how you want it, this is really important as you’re going to be spending many hours playing poker on it. 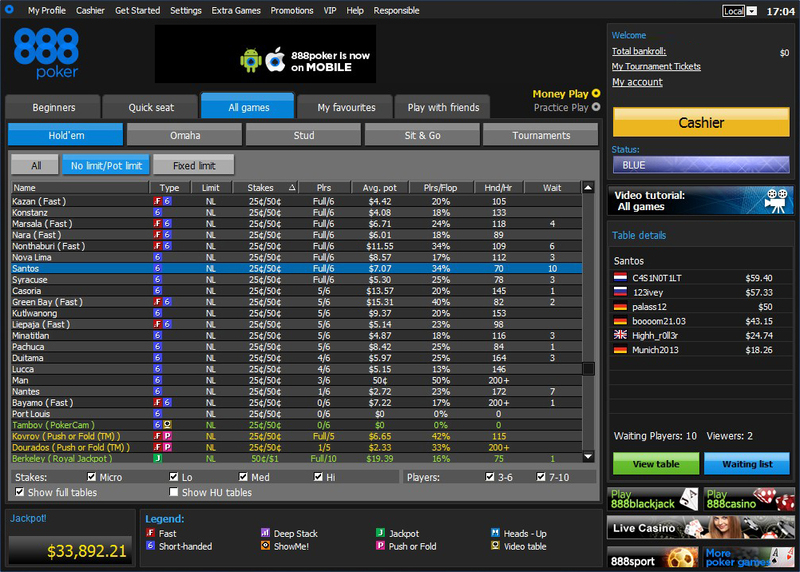 To customise the ‘look and feel’ of the 888 Poker client from any open table go to ‘Table Options’ (in the top right hand corner) and then Settings. What you’ll find here are five tabs which allow you to amend the various settings -‘table layout’ is the big one – from here you can choose from eleven attractive table themes, eleven card decks and six card faces. Then in ‘personal image’ there is a real plethora of options to find an avatar that you’d like to represent your player at the 888 tables. Also notable is the ‘video/audio’ section – you’ll notice this gives you options for your webcam, microphone and speakers and you’d be forgiven for wondering why this is. This is because 888, being the innovative brand they are, introduced ‘Poker Cam’ tables – with the gimmick being that you can see and hear your opponents! It really makes the games so much more dynamic, interesting and is a great novelty for you to try. I would say though that ‘serious’ poker players tend not to use this facility/type of table; the upside of that being that the competition on the 888 Poker Cam tables is incredibly soft. It’s one of those features that you’ll either love or hate but definitely worth a try just for the experience! 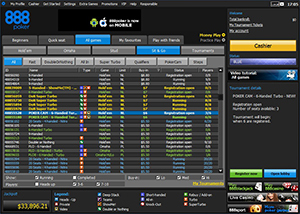 The 888 software is a real gem for multi-tabling; many of us poker players these days want to increase our hourly rate and number of games played by playing more than one table at once. 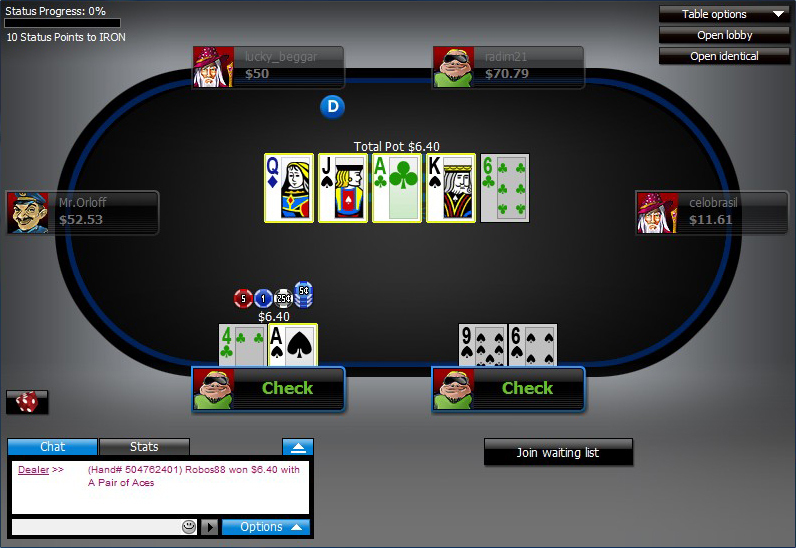 Well, at 888 Poker you can play an unlimited number of tables at once (only limited by the number you feel comfortable playing at) and have the option to tile or cascade your tables on the screen. I personally use tiling; I find the tables work really well as you can resize the window to a nice small size without losing clarity of what’s going on in the table. 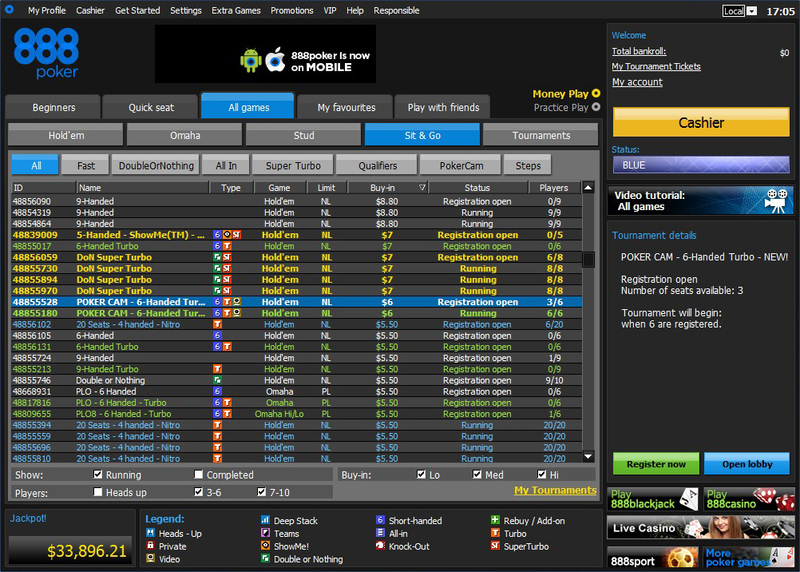 My only criticism of the 888 Poker software is in the lobby itself, I feel there’s too many colours used, it can be visually quite distracting and sometimes tricky to locate easily the game/stake you want, at a glance. This can be combated though by using the ‘My favourites’ or ‘Quick seat’ tabs which allow you to get seated at a game within just a few clicks. Colour gripes aside though it is well designed and, above all, very stable. I don’t think it’s possible to really pigeon-hole 888 when it comes to how soft it is, however, what we can say is that there aren’t hundreds and hundreds of professional players like you’d find, say, on PokerStars. Certainly at the low-micro stakes (and even at the medium to some extent) there are plenty of bad players to take money from. The reason may well be that there are plenty of first time players; people who perhaps start using 888 for the sports betting or casino offerings and then feel like trying their hands at poker. Standard seats: 2, 5, 6, 9 and 10. Options: Poker Cam (video), Fast, Shorthanded, Deepstack, Show Me, Jackpot, Push and Fold, Heads Up. 888 Poker have one of the best number of stake options available for NLHE cash tables, from the micros right up to $500/$1000. The traffic levels are really good at the micro-low level, and are decent at the medium-high (but don’t expect full tables at $50/$100 upwards unless it’s a really peak playing time). The Omaha tables get a fair bit of traffic but pretty much all of it is at 6-max tables rather than full ring. Stud is offered, however, the traffic here isn’t impressive although is playable at peak hours, off-peak (e.g. during daytimes) you can only expect to see a handful of players. Options: Video, Heads Up, Deepstack, Teams, Show Me, Shorthanded, Allin, Knockout, Rebuy / Addon, Turbo, Super Turbo. Games: Texas Holdem (NLH), Omaha (PLO and PLO 8). 888 Poker is absolute heaven for the low or micro stakes MTT player with a whole bunch of games and formats to choose from, medium and high stakes are catered for as well but with not as much choice. Still, it’s fair to say there’s something here for everyone no matter what your level of play is. The big draw here is the $1,000,000 guaranteed ‘Daily Challenge’ Series, which has that huge prize-pool guaranteed each month. Each day of the week there is a tournament, featuring buy-ins from $22 and satellites from $0.99 with individual prize-pools of up to $100,000. Each day has a theme, e.g. ‘Magic Monday’, ‘Wonderful Wednesday’ and so on. 888 offer a great range of freerolls, from actual free entry to small ticket entry using player points. For example, there’s the ‘Beginners Freeroll’ which pays out an iPad, an iPad Nano and vouchers for the 888 Poker shop. Reward Freerolls run around the clock, some for all players, others dependent upon your player status. The 888 freerolls are well worth playing, mainly because the standard of play on them is impressively bad, so if you can be patient you can quite easily score a cash and therefore increase your 888 bankroll pretty easily. Options: Video (Poker Cam), Short Handed, Double Stack, Double or Nothing, Knockout, Turbo and Super Turbo. It’s fair to say that 888 really excel when it comes to their SNG offerings. There is a vast array of buy-ins available and, with excellent player traffic across the stakes, there is something for everyone here. As well as standard SNG formats, 888 also offers ‘Fast’ (i.e. Turbo), Super Turbo, Double or Nothing, All in or Fold and ‘PokerCam’ ones (where you can see each player via their webcams). When you play poker at 888 your loyalty is appreciated and is rewarded through “888 Poker Rewards” with cashback, gifts, bonuses and freerolls. There are 10 statuses to achieve at anytime, once you have reached the points threshold you remain at that stage, reaping the benefits, until the end of the next month. Once you reach VIP level you are granted that status for 12 months. Check out the weekly Status Fastrack Tournaments where, not only can you win your new improved status, cash is on offer too. At every level there are daily freerolls. Your status points convert to reward points at a greater rate the higher you climb, at the very top – VIP Diamond you exchange rate is 1 status point = 18 Reward Points! You can spend your points earned at the excellent 888 Poker Shop, where you can buy near enough anything you could ever think of, for example: electronics, gifts, audio items, real luxury items including holidays, bikes and even cars! 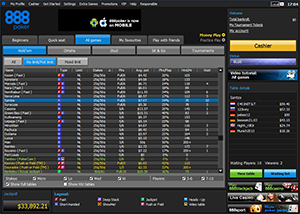 888 will soon be offering player leader-boards which will make for a really competitive playing field. 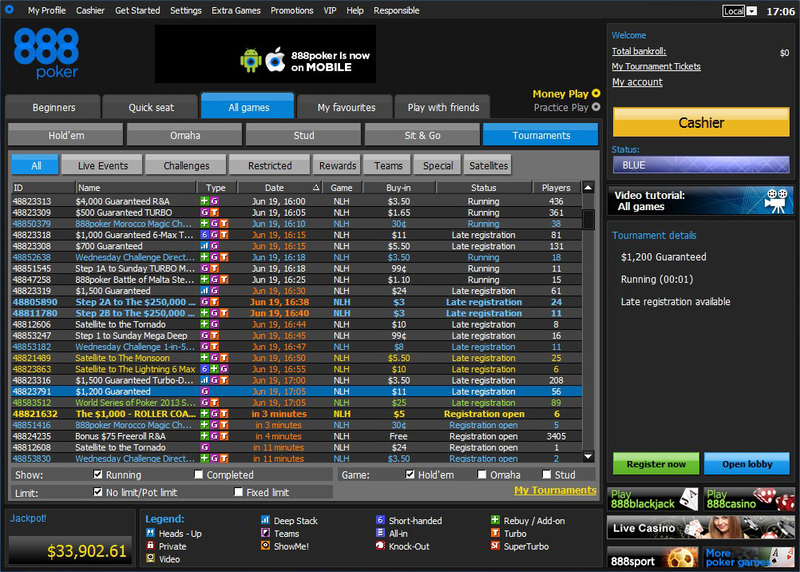 In the meantime you can enjoy some healthy banter and competition at the ‘My 888 Poker’ player community where you can engage with your fellow players and join in the discussion about poker, strategy and anything else on their very active player forum. Registered Address: Cassava Enterprises Ltd, Suite 601-701, Europort Avenue, Europort, Gibraltar. I mentioned earlier about the 888 Poker customer service – it’s definitely one of the best in the business and something I’ve used from time to time. There is an excellent online help section which usually has the answer to your query if you don’t mind a bit of digging. But, if you can’t find what you’re after, you can opt to email their support team. Now, their support team are really good at getting back to you quickly (I once had a reply within ten minutes for example) and they’re very knowledgeable but using the new freephone number has got to be the best as it’s always good to have an instant solution. 888 Poker last reviewed by DirectoryOnlinePoker.com April 2019. All rights reserved.